The Corning Hot Plate Stirrer PC 420 is a reliable workhorse and can be used for a variety of applications and commonly found in a laboratory environment. The Corning hotplate stirrers and magnetic lab stirrers are built out of quality materials used to ensure product longevity. The Corning PC-420 comes equipped with a pryoceram ceramic top and adjustable temperature and speed knob sitting in front of the stir plate allowing for quick access. This hot plate stirrer has a temperature range of between 25-550°C and a speed range up to 1200 RPM. All Corning stirrers use a belt which spins off a pulley system and are easily replaceable. Temperature set points are quickly achieved in a few seconds and light indicator illuminates in the front to alert user the surface is hot. 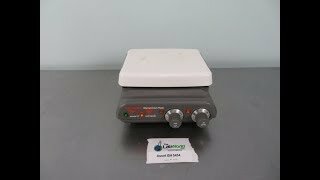 Top Dimensions 7 x 5"
This Corning Hotplate Stirrer PC-420 has been fully tested and comes complete with our standard warranty. All of our lab equipment comes backed with our standard warranty. Should you have any questions, please don't hesitate to contact us.